In New York, a hydropower developer must file a Large Facility Interconnection Request (LFIR) with the New York Independent System Operator (NYISO) and obtain approval in order to connect a new large generating facility with a capacity of more than twenty (20) MW, or a merchant transmission facility to the New York State (NYS) Transmission System. A developer may also need to file an LFIR with NYISO for material modifications to an existing large facility or modifications to an existing Interconnection Request. NYISO Transmission Expansion and Interconnection Manual, at § 3.1; NYISO Open Access Transmission Tariff (OATT) §§ 3.9, 4.5.8, 3.11, 4.5.9. All new large generating facilities and merchant transmission facilities that are proposed to interconnect to the NYS Transmission System are subject to the Large Facility Interconnection Procedures (LFIP). NYISO Transmission Expansion and Interconnection Manual, at § 3.3.1.1; NYISO Open Access Transmission Tariff (OATT) § 30.1. A material modification to an existing large facility or project currently in the interconnection process. NYISO Open Access Transmission Tariff (OATT) § 30.3.3.1. In addition, the developer must submit with the LFIR for a new large facility or merchant transmission facility a $10,000 non-refundable application fee, $30,000 refundable interconnection feasibility study deposit, and either demonstration of site control, or an additional $10,000 deposit in lieu of demonstration of site control. NYISO Open Access Transmission Tariff (OATT) § 30.3.3.1. After receiving the LFIR, NYISO will send an acknowledgement notice to the developer and provide a copy of the LFIR to the Connecting Transmission Owner (CTO). Within five (5) business days of receipt of the LFIR, NYISO then assigns the new LFIR a queue position based on the date and sequence it was received pursuant to NYISO Open Access Transmission Tariff (OATT) § 30.4.1. NYISO Open Access Transmission Tariff (OATT) § 30.3.3.2; NYISO Transmission Expansion and Interconnection Manual, at § 30.3.3.1. NYISO performs an initial review of the LFIR and determines whether it is valid (i.e., satisfies the requirements of an LFIR) per NYISO Open Access Transmission Tariff (OATT) §§ 30.3.1 and 30.3.3.1 or deficient in some way. The notice provides the developer an opportunity to cure the deficiency pursuant to NYISO Transmission Expansion and Interconnection Manual, at § 30.3.3.3. If additional information is requested, the developer must submit the subsequent information needed to constitute a valid request within ten (10) business day after receipt of the deficiency notice. NYISO Transmission Expansion and Interconnection Manual, at § 3.3.3. After receiving the requested information from the developer, NYISO will promptly forward the additional information to the CTO. NYISO Open Access Transmission Tariff (OATT) § 30.3.3.3. NYISO will also send the developer and CTO acknowledgement of the valid LFIR. NYISO Open Access Transmission Tariff (OATT) § 30.6.1. If the developer does not submit the requested information within ten (10) business days, NYISO will deem the LFIR withdrawn and provide notice to the developer that the LFIR is withdrawn with an explanation for the withdrawal. NYISO Open Access Transmission Tariff (OATT) §§ 30.3.3.3, 30.3.6. Upon receipt of such written notice, the developer must cure the deficiencies within fifteen (15) business days in which to either respond with information or actions that cure the deficiency or to notify NYISO of its intent to pursue dispute resolution. NYISO Open Access Transmission Tariff (OATT) § 30.3.6. Simultaneously with the acknowledgement of a valid LFIR, NYISO will provide the developer and CTO an Interconnection Feasibility Study Agreement (FESA). The FESA will specify that the developer is responsible for the actual cost of the Interconnection Feasibility Study. NYISO Open Access Transmission Tariff (OATT) § 30.6.1. NYISO must schedule a scoping meeting within ten (10) business days after receipt of a valid interconnection request. NYISO must hold the scheduled scoping meeting no later than thirty (30) calendar days from receipt of the valid interconnection request, unless otherwise mutually agreed upon by the Parties (NYISO, the developer, and the CTO). NYISO Open Access Transmission Tariff (OATT) § 30.3.3.4. General deliverability issues as may be reasonably required to accomplish the purpose of the meeting. NYISO Open Access Transmission Tariff (OATT) § 30.3.3.4. Which party or parties will perform the study, or various portions of the study? NYISO Transmission Expansion and Interconnection Manual, at § 3.3.3.2. Section 30.6.1 of NYISO Open Access Transmission Tariff (OATT) allows the Parties to forgo the Feasibility Study, if the Parties mutually agree. However, if the Parties agree to forego the Feasibility Study, certain evaluations that would have been required in the Feasibility Study may need to be addressed in the SRIS. NYISO Transmission Expansion and Interconnection Manual, at § 3.3.3.2. NYISO has overall responsibility for the performance of all interconnection studies under the LFIP, and may elect to perform all or portions of any given study. However, Section 30.13.4 of NYISO Open Access Transmission Tariff (OATT) gives NYISO discretion to request the CTO perform all or portions of a study, or to utilize a third party (e.g., an engineering consultant) to perform all or portions of a study. In considering using a third party, either NYISO or the developer may enter into the third party contract, at NYISO’s discretion. The various options for performing the first interconnection study for a new LFIR are discussed at the scoping meeting. NYISO Transmission Expansion and Interconnection Manual, at § 3.3.3.2. The Parties may reach agreement on some or all options required to proceed forward within the first interconnection study at the scoping meeting. However, if the Parties do not reach an agreement on all options, the developer must provide their decisions or proposals on any outstanding issues to the NYISO within five (5) business days following the scoping meeting. Upon receipt of the developer’s input, NYISO will begin preparation of the applicable study agreement for review and execution by the Parties. NYISO Transmission Expansion and Interconnection Manual, at § 3.3.3.2. 8-NY-g.15 – Is a Feasibility Study (FES) Required? If the Parties decide not to perform a Feasibility Study (FES) then the developer should go to 8-NY-g.26 – Interconnection System Reliability Impact Study (SRIS). If the Parties decide to perform a FES then they should perform the study in accordance with NYISO Open Access Transmission Tariff (OATT) § 30.6. The FES is a preliminary evaluation of the system impact and cost of interconnecting the large generating facility or merchant transmission facility to the New York State Transmission System or to the Distribution System. NYISO Open Access Transmission Tariff (OATT) § 30.1; NYISO Open Access Transmission Tariff (OATT) § 30.6.2. Preliminary identify the CTO’s attachment facility and any system upgrade facilities that would be required to interconnect the project to the system in a reliable manner, and develop nonbinding good faith estimates of the cost and time to construct the required facilities. NYISO Transmission Expansion and Interconnection Manual, at § 3.3.3.3. Within five (5) business days following the scoping meeting, the developer must specify for inclusion in the attachment to the FESA the points of interconnection and any reasonable alternative point(s) of interconnection. NYISO Open Access Transmission Tariff (OATT) § 30.6.1. Within five (5) business days following NYISO’s receipt of such designation, NYISO must tender the FESA to developer, which includes a good faith estimate of the cost for completing the FES. NYISO Open Access Transmission Tariff (OATT) § 30.6.1. The FESA specifies the scope of work, terms and arrangements for completing the study and payment of study costs. NYISO Transmission Expansion and Interconnection Manual, at § 3.3.3.3. NYISO initially prepares the FES Scope pursuant to NYISO Open Access Transmission Tariff (OATT) § 30.6.2. After NYISO tenders the FESA to the developer, the developer must return the executed FESA to NYISO within thirty (30) days after its receipt along with the additional $30,000 deposit, if such deposit is required. Otherwise, NYISO initiates withdrawal of the LFIR under NYISO Open Access Transmission Tariff (OATT) § 30.3.6. After the Parties have fully executed the FESA, the responsible Parties must perform the FES in accordance with NYISO Open Access Transmission Tariff (OATT) §§ 30.6.2-30.6.3, the FESA, and the applicable reliability standards. NYISO Open Access Transmission Tariff (OATT) §§ 30.6.2. NYISO must use reasonable efforts to complete the FES no later than forty-five (45) calendar day after NYISO receives the fully executed FES. NYISO Open Access Transmission Tariff (OATT) §§ 30.6.3. After conducting the FES, the responsible Parties compose a draft FES Report. Note: NYISO serves as overall coordinator for the study, including coordinating a review of the draft FES Report and associated documentation by the Parties. NYISO Transmission Expansion and Interconnection Manual, at § 3.3.3.3. Upon completion of all the study tasks, including review of the draft study report and supporting documentation, NYISO provides the final FES Report to the developer and CTO and schedules a study report meeting with the developer and CTO per Section 30.6.3.1 of the NYISO Open Access Transmission Tariff (OATT). Within ten (10) business days of providing an FES study report to the developer, NYISO and CTO must meet with the developer to discuss the results of the FES study. NYISO Open Access Transmission Tariff (OATT) § 30.6.3.1. The FES study report meeting serves the dual purpose of reviewing the final FES results and discussing the scope and arrangement for the System Reliability Impact Study (SRIS). If any electric system(s) other than the CTO may be affected by the proposed interconnection, NYISO invites the affected system operators to the FES study report meeting to participate in the discussion of the SRIS. At this point of the NYISO interconnection process the affected system operators become involved. NYISO Transmission Expansion and Interconnection Manual, at § 3.3.3.3. An affected system operator is an entity that operates an electric system other than the transmission system owned controlled or operated by the CTO that may be affected the proposed interconnection. NYISO Open Access Transmission Tariff (OATT) § 30.1. 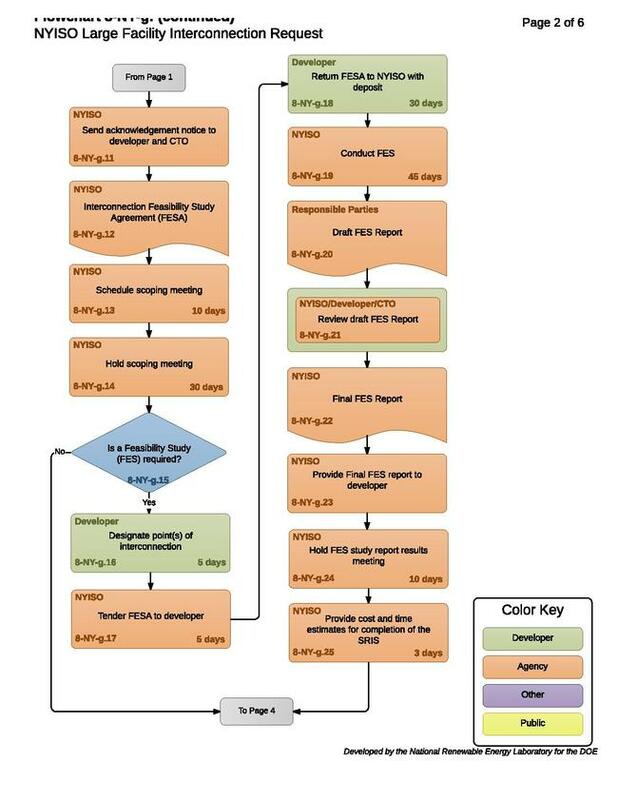 Within three (3) business days following the FES Study results meeting, NYISO will provide the developer with a non-binding good faith estimate of the cost and timeframe for completing the Interconnection SRIS, the next step in the NYISO Interconnection Request process. NYISO Open Access Transmission Tariff (OATT) § 30.1. Upon completion of the FES, or if the Parties have agreed to forego the FES pursuant to the scoping meeting provided in NYISO Open Access Transmission Tariff (OATT) § 30.3.3.4, the next step of the NYISO Interconnection Request process is the Interconnection System Reliability Impact Study (SRIS). NYISO Transmission Expansion and Interconnection Manual, at § 3.3.3.4. Simultaneously with the delivery of the FES to the developer, NYISO must provide the developer and CTO an Interconnection System Reliability Impact Study Agreement (SRISA). NYISO Open Access Transmission Tariff (OATT) § 30.7.1. The SRISA must provide that the developer will compensate NYISO and CTO for the actual cost of the SRIS. NYISO Open Access Transmission Tariff (OATT) § 30.7.1. If NYISO, CTO, and the developer agree to forego the FES, NYISO will initiate an SRIS under NYISO Open Access Transmission Tariff (OATT) § 30.7 of the LFIP and apply the $30,000 deposit provided with the Interconnection Request, towards the SRIS. NYISO Open Access Transmission Tariff (OATT) § 30.6.1. 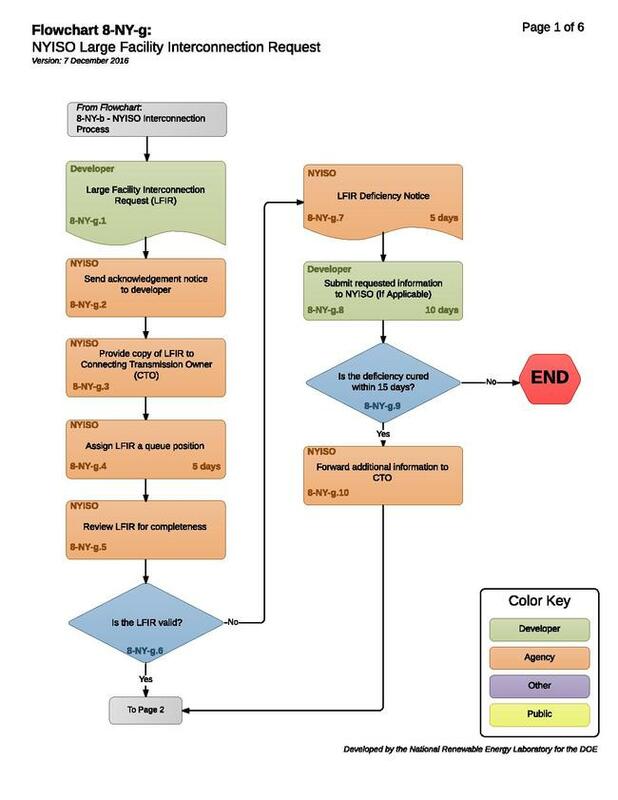 8-NY-g.27 – Does the Developer Request an Optional Interconnection Study (OIS)? Upon the initiation of a developer’s SRIS, the developer may request an Optional Interconnection Study (OIS). 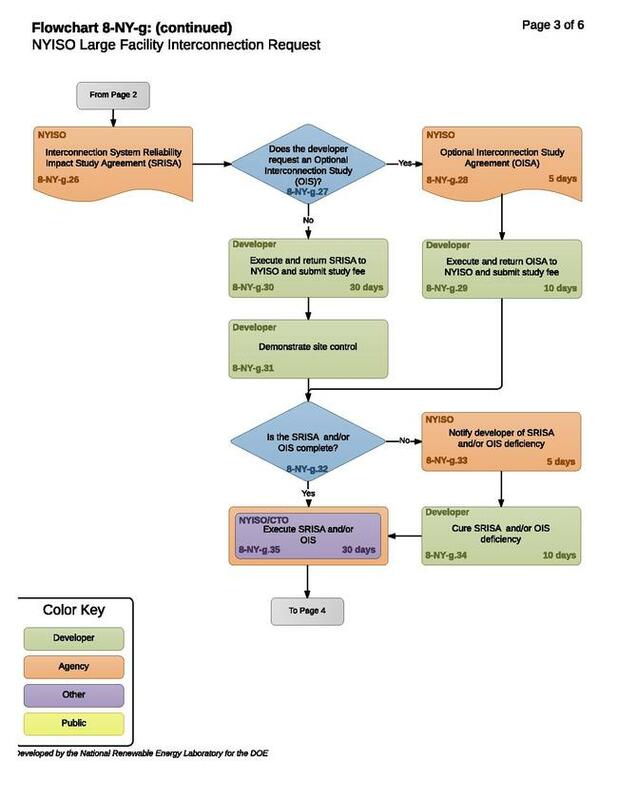 If the developer requests an OIS, NYISO must perform the OIS concurrently with the SRIS. NYISO Open Access Transmission Tariff (OATT) § 30.10.1. The developer may submit an OIS on or before the NYISO Operating Committee approval of the SRIS scope or execution of the SRISA. NYISO will not accept an OIS request after the SRIS has begun. NYISO Transmission Expansion and Interconnection Manual, at § 3.3.3.5. The request for the OIS must describe the assumptions that the developer wishes NYISO to study within the scope described in NYISO Open Access Transmission Tariff (OATT) § 30.10.2. NYISO Open Access Transmission Tariff (OATT) § 30.10.1. 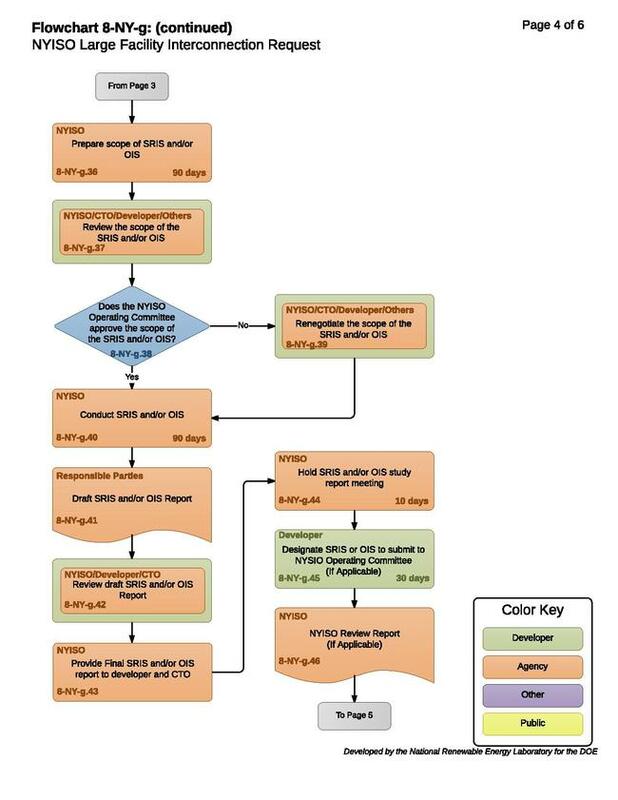 The concept of the OIS is to provide a mechanism for the developer to continue to consider and evaluate an alternative point of interconnection during the SRIS step of the interconnection process. NYISO Transmission Expansion and Interconnection Manual, at § 3.3.3.5. The OIS is performed in conjunction with, and with sensitivity to, the SRIS. “The OIS essentially follows the same procedural steps as the SRIS up to submittal of the study report to the NYISO Operating Committee for approval,” discussed below in element 8-NY-g.38 – Does the NYISO Operating Committee Approve the Scope of the SRIS and/or OIS? NYISO Transmission Expansion and Interconnection Manual, at § 3.3.3.5. 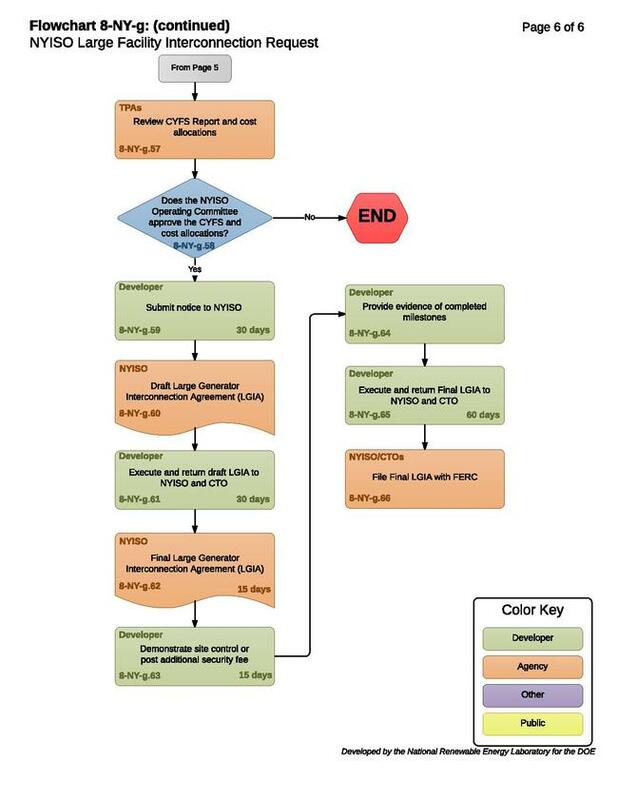 Within five (5) business days after receipt of a request for an OIS, NYISO must provide the developer with an Optional Interconnection Study Agreement (OISA). NYISO Open Access Transmission Tariff (OATT) § 30.10.1. NYISO’s estimate of the cost of the OIS. NYISO Open Access Transmission Tariff (OATT) § 30.10.1. The developer must execute the OSIA within ten (10) business days of receipt and deliver the OISA, the technical data and a $10,000 deposit to NYISO. NYISO Open Access Transmission Tariff (OATT) § 30.10.1. The developer must execute the SRISA and deliver the executed SRISA to NYISO no later than thirty (30) days after its receipt along with demonstration of site control and the required deposit. NYISO Open Access Transmission Tariff (OATT) § 30.7.2. If NYISO is responsible for performing the entire study, the required deposit is $120,000 ($150,000 if the developer elects to include a preliminary, non-binding evaluation of the large facility’s deliverability under the deliverability interconnection standard). If the developer is hiring a third-party consultant to perform the analytical portion of the study, the required deposit is $40,000 ($70,000 if the developer elects to include a preliminary, non-binding evaluation of the large facility’s deliverability under the deliverability interconnection standard). NYISO Open Access Transmission Tariff (OATT) § 30.7.2. 8-NY-g.32 to 8-NY-g.35 – Is the SRISA and/or OIS Complete? NYISO must notify the developer, within five (5) business days of the receipt of the executed SRISA and/or OIS, if the developer does not provide all the required technical data when delivering the SRISA to NYISO. The developer must cure any deficiency within ten (10) business days of receipt of the notice, provided, however, such deficiency does not include failure to deliver the executed SRISA and/or OIS or deposit. NYISO Open Access Transmission Tariff (OATT) § 30.7.2. If the developer does not cure the deficiency within ten (10) business days, NYISO initiates withdrawal of the LFIR under NYISO Open Access Transmission Tariff (OATT) § 30.3.6. NYISO Transmission Expansion and Interconnection Manual, at § 3.3.3.4; NYISO Transmission Expansion and Interconnection Manual, at § 3.3.3.5. NYISO and CTO must execute the SRISA and/or OIS within thirty (30) days after its receipt by the developer. NYISO Open Access Transmission Tariff (OATT) § 30.7.2; NYISO Transmission Expansion and Interconnection Manual, at § 3.3.3.5. Concurrently and in coordination with the SRISA and/or OISA, NYISO initially prepares the SRIS and/or OIS scope following a standard template consistent with the NYISO Open Access Transmission Tariff (OATT) § 30.7.3. NYISO Transmission Expansion and Interconnection Manual, at §§ 3.3.3.4-3.3.3.5. The Parties (NYISO, CTO, and the developer), any affected system operators, and the NYISO Transmission Planning Advisory Subcommittee (TPAs) review the SRIS and/or OIS Scope. NYISO Transmission Expansion and Interconnection Manual, at §§ 3.3.3.4-3.3.3.5; NYISO Open Access Transmission Tariff (OATT) § 30.7.3. The NYISO Operating Committee must approve the specific study scope proposed for each SRIS and/or OIS. NYISO Open Access Transmission Tariff (OATT) § 30.7.3. NYISO must attach the approved SRIS and/or OIS Scope as an exhibit of the SRISA and/or OIS. The scope specifies whether a full or a partial SRIS and/or OIS is required. NYISO Transmission Expansion and Interconnection Manual, at §§ 3.3.3.4 -3.3.3.5; NYISO Open Access Transmission Tariff (OATT) § 30.7.3. Note: A full SRIS is required for large facility projects 80 MW or greater in size. Projects less than 80 MW in size require only a partial SRIS. The requirements for a full versus partial SRIS are the same except that an assessment of the impact of the project on interface transfer limits that is required for a full SRIS, is not required for a partial SRIS. NYISO Transmission Expansion and Interconnection Manual, at § 3.3.3.4. After the Parties have fully executed the SRISA and/or OISA, and the Operating Committee has approved the SRIS and/or OIA scope, the responsible Parties must conduct the SRIS and OIA in accordance with the applicable provisions of the NYISO Open Access Transmission Tariff (OATT), the SRISA and/or OISA, SRIS and/or OIS Scope, and the relevant interconnection standards. NYISO Open Access Transmission Tariff (OATT) § 30.7; NYISO Transmission Expansion and Interconnection Manual, at § 3.3.3.5. NYISO must coordinate the SRIS and/or OIS with any affected system that is affected by the Interconnection Request pursuant to NYISO Open Access Transmission Tariff (OATT) § 30.3.5. NYISO must utilize existing studies to the extent practicable when it performs the study. NYISO Open Access Transmission Tariff (OATT) § 30.7.4. NYISO must use reasonable efforts to complete the SRIS within ninety (90) days after the receipt of the fully executed SRISA, study payment, and technical data. NYISO Open Access Transmission Tariff (OATT) § 30.7.4. The SRIS should evaluate the impact of the proposed large generating facility or merchant transmission facility on the safety and reliability of the New York State Transmission System and, if applicable an affected system. The SRIS should also determine what attachment facilities, distribution upgrades and system upgrade facilities are needed for the proposed large generation facility or merchant transmission facility of the developer to connect reliability to the New York State Transmission System or Distribution System in a manner that meets the NYISO Minimum Interconnection Standard. NYISO Open Access Transmission Tariff (OATT) § 30.1. Identify NYISO’s estimate of the cost of the OIS. To the extent know by NYISO, estimates should include any costs expected to be incurred by an affected system whose participation is necessary to complete the OIS. NYISO Open Access Transmission Tariff (OATT) § 30.10. The responsible Parties compose a draft SRIS and/or OIS Report. NYISO Transmission Expansion and Interconnection Manual, at §§ 3.3.3.4-3.3.3.5. NYISO serves as the overall coordinator for the study, including coordinating the review of the draft SRIS and/or OIS report and associated documentation by the Parties and any affected system operators. NYISO Transmission Expansion and Interconnection Manual, at §§ 3.3.3.4-3.3.3.5. 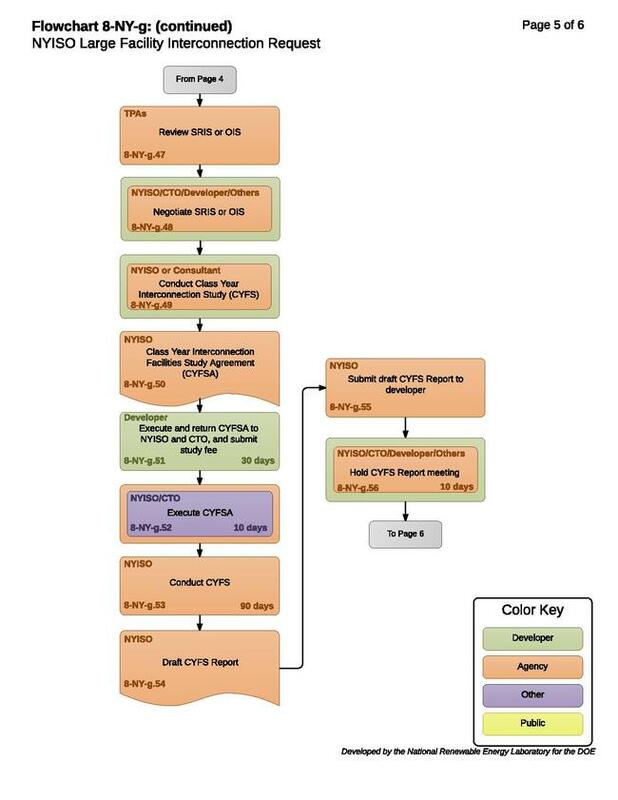 Upon completion of all the study tasks, including initial review of the draft study report and documentation, NYISO must provide the draft SRIS and/or OIS report to the developer and CTO and schedule a study report meeting with the developer and CTO per Section 30.7.5 of NYISO Open Access Transmission Tariff (OATT). NYISO Transmission Expansion and Interconnection Manual, at §§ 3.3.3.4-3.3.3.5. Within ten (10) business days of providing the SRIS and/or OIS report to the developer, NYISO and the CTO must meet with the developer to discuss the results of the SRIS and/or OIS. NYISO Open Access Transmission Tariff (OATT) § 30.7.5; NYISO Transmission Expansion and Interconnection Manual, at §§ 3.3.3.4-3.3.3.5. Following the review of the scope of the SRIS (and OIS, if applicable), NYISO must arrange for submittal of the SRIS or OIS report to the NYISO Operating Committee for consideration and approval. First, however, if one or more OIS(s) were performed concurrently, the developer must designate which study the SRIS or OIS to submit to the NYISO Operating Committee as “the” SRIS. The NYISO Operating Committee will not approve alternative interconnection studies for the same project. NYISO Transmission Expansion and Interconnection Manual, at §§ 3.3.3.4-3.3.3.5. Following the study report meeting, NYISO must arrange for submittal of the SRIS report (either the SRIS or OIS) to the NYISO Transmission Planning Advisory Subcommittee (TPAs) for review and consideration and recommendation for NYISO Operating Committee approval. If NYISO staff does not perform the SRIS, NYISO staff prepares and submits a “NYISO Review Report” to accompany the SRIS report, to summarize NYISO staff’s review and conclusions regarding the SRIS. The TPAs will review and consider each submitted SRIS or OIS separately on its own merit. NYISO Transmission Expansion and Interconnection Manual, at §§ 3.3.3.4-3.3.3.5. The NYISO Operating Committee must approve each final SRIS or OIS, and may need to renegotiate the terms. Upon Operating Committee approval of the SRIS or OIS, NYISO considers the SRIS or OIS for that project complete. NYISO Open Access Transmission Tariff (OATT) § 30.7.4; NYISO Transmission Expansion and Interconnection Manual, at §§ 3.3.3.4-3.3.3.5. After completion of the SRIS, the next step is the Class Year Interconnection Facilities Study (CYFS), often referred to as the Facilities Study. NYISO or a third party consultant must conduct the CYFS for the developer to determine a list of facilities (including CTO’s attachment facilities, distribution upgrades, system upgrade facilities and system deliverability upgrades as defined in the SRIS), the cost of those facilities, and the time required to interconnect the large generating facility or merchant transmission facility with the NYS Transmission System or with the Distribution System. NYISO Open Access Transmission Tariff (OATT) § 25.1.2. NYISO or the third party consultant must conduct the CYFS for a set of projects that have met the eligibility requirements for entry into a Class Year and either were required or elect to do so. NYISO Transmission Expansion and Interconnection Manual, at § 3.3.3.6. Satisfaction of at least one regulatory milestone outlined in NYISO Open Access Transmission Tariff (OATT) § 25.6.2.3. NYISO Open Access Transmission Tariff (OATT) § 25.6.2.3.1.1. A notice of availability of a draft environmental impact statement for the large facility filed with the U.S. Environmental Protection Agency pursuant to the National Environmental Policy Act. Note: After a large facility’s SRIS is approved by the NYISO Operating Committee and until NYISO confirms that the large facility has satisfied the regulatory milestone, the developer must inform NYISO each year, within five (5) business days of the Class Year Start Date, whether or not the large facility has satisfied the regulatory milestone. If the project fails to inform NYISO by this date, NYISO deems the Interconnection Request of the project withdrawn in accordance with NYISO Open Access Transmission Tariff (OATT) § 3.6. NYISO Open Access Transmission Tariff (OATT) § 25.6.2.3.1. The project must also satisfy the regulatory milestone within two (2) years of the NYISO Operating Committee’s approval of the SRIS for the project. If the project fails to satisfy the regulatory milestone within this time period, NYISO will deem the Interconnection Request of the project withdrawn in accordance with NYISO Open Access Transmission Tariff (OATT) § 30.3.6. NYISO Open Access Transmission Tariff (OATT) § 25.6.2.3.2. As soon as practicable after a study start date is established pursuant to NYISO Open Access Transmission Tariff (OATT) § 25.5, NYISO must provide a Class Year Interconnection Facilities Study Agreement (CYFSA) for the next class year to each developer and CTO who has not previously received an agreement, upon confirmation by NYISO that the developer is an eligible class year project. NYISO Open Access Transmission Tariff (OATT) § 30.8.1. The CYFSA must provide that the class year project will compensate NYISO and CTO for the actual cost of the CYFS. When NYISO provides the CYFSA to the developer, NYSIO must provide the developer with a non-binding good faith estimate of the cost and timeframe for completing the CYFS. NYISO Open Access Transmission Tariff (OATT) § 30.8.1. The developer must execute the CYFSA and return the executed CYFSA and technical data to NYISO and the CTO within thirty (30) days after the developer’s receipt of the CYFSA. The developer must also submit with the CYFSA the class year project’s interconnection service evaluation election, and the study fee to NYISO. NYISO and the CTO must then execute the CYFSA within ten (10) business days of receipt of the CYFSA executed by the developer and required technical data. NYISO Open Access Transmission Tariff (OATT) § 30.8.1. NYISO must coordinate the CYFS with the CTOs and affected transmission owners, and with any other affected system pursuant to NYISO Open Access Transmission Tariff (OATT) § 30.3.5. NYISO must utilize existing studies to the extent practicable in performing the CYFS. NYISO must also follow the procedures set forth in NYISO Open Access Transmission Tariff (OATT) § 25. NYISO must also use reasonable efforts to complete the study and issue a CYFS report to the developer within the timeframe called for in NYISO Open Access Transmission Tariff (OATT) § 25. NYISO Open Access Transmission Tariff (OATT) § 30.8.3. Commissioning need for the class year in accordance with good utility practice. NYISO Open Access Transmission Tariff (OATT) § 30.8.2. For each of these categories the CYFS must specify and estimate of the cost of work to be done at each substation and/or on each feeder to physically and electrically connect each facility in the class year to the transmission system. NYISO Open Access Transmission Tariff (OATT) § 30.8.2. NYISO must then compose and submit a draft of the CYFS Report to the developer. NYISO Open Access Transmission Tariff (OATT) § 30.8.4. Within ten (10) business days of providing a draft CYFS Report to the developer, NYISO, the CTOs, and affected transmission owners must meet with the developer to discuss the result of the CYFS. NYISO Open Access Transmission Tariff (OATT) § 30.8.4; NYISO Transmission Expansion and Interconnection Manual. After the CYFS Report meeting NYISO must submit the CYFS Report and cost allocations to TPAs for review and then to the NYISO Operating Committees for approval. NYISO Open Access Transmission Tariff (OATT) §§ 25.6.1.1, 25.6.2, 25.7.7; NYISO Transmission Expansion and Interconnection Manual. Within thirty (30) days following the approval of CYFS Report the developer must provide notice to NYISO, in writing and via electronic mail, stating whether to accept (Acceptance Notice) or not accept (Non Acceptance Notice) the project cost allocations and deliverable megawatts, if any, reported to it by NYISO. NYISO Open Access Transmission Tariff (OATT) § 25.8.2; NYISO Transmission Expansion and Interconnection Manual. As soon as practicable upon completion of the above-mentioned studies, NYISO must tender to the developer and CTO a draft Large Generator Interconnection Agreement (LGIA). NYISO Open Access Transmission Tariff (OATT) § 30.11.1; NYISO Transmission Expansion and Interconnection Manual. The developer must then execute and return the completed draft LGIA appendices to NYISO and CTO, within thirty (30) days of tender. NYISO Open Access Transmission Tariff (OATT) § 30.11.1; NYISO Transmission Expansion and Interconnection Manual. Note: If the developer does not execute the LGIA or initiate dispute resolution, pursuant to NYISO Open Access Transmission Tariff (OATT) § 30.11.2, within six (6) months of tender of the draft LGIA, NYISO will deem the Interconnection Request withdrawn. NYISO Open Access Transmission Tariff (OATT) § 30.11.2. NYISO and CTO must provide the final LGIA to the developer within fifteen (15) days of completion of the negotiation process, if necessary pursuant to NYISO Open Access Transmission Tariff (OATT) § 30.11.2. Application for an air, water, or land use permit. NYISO Open Access Transmission Tariff (OATT) § 30.11.3. The developer must then either execute three (3) originals of the tendered final LGIA and return them to NYISO and the CTO, or request in writing that NYISO and the CTO file with Federal Energy Regulatory Commission (FERC) an LGIA in unexecuted form within sixty (60) days of tendered draft LGIA. As soon as practicable, but not later than ten (10) business days after receiving either the three executed originals of the tendered LGIA or the request to file an unexecuted LGIA, NYISO and CTO must file the final LGIA with FERC. NYISO Open Access Transmission Tariff (OATT) § 30.11.3. The developer, NYISO and CTOs must perform their respective obligations in accordance with the terms of the LGIA, subject to modification by FERC. NYISO Open Access Transmission Tariff (OATT) § 30.11.3. The developer and CTOs may proceed with the construction of the facilities in accordance with NYISO Open Access Transmission Tariff (OATT) § 30.12. After receiving the LFIR, NYISO will send an acknowledgement notice to the developer and provide a copy of the LFIR to the Connecting Transmission Owner (CTO). Within five (5) business days of receipt of the LFIR, NYISO then assigns the new LFIR a queue position based on the date and sequence it was received pursuant to NYISO Open Access Transmission Tariff (OATT) § 30.4.1.. NYISO Open Access Transmission Tariff (OATT) § 30.3.3.2; NYISO Transmission Expansion and Interconnection Manual, at § 30.3.3.1. The NYISO Operating Committee must approve the specific study scope proposed for each SRIS and/or OIS. NYISO Open Access Transmission Tariff (OATT) § 30.7.3. NYISO must attach the approved SRIS and/or OIS Scope as an exhibit of the SRISA and/or OIS. The scope specifies whether a full or a partial SRIS and/or OIS is required. NYISO Transmission Expansion and Interconnection Manual, at §§ 3.3.3.4 -3.3.3.5; NYISO Open Access Transmission Tariff (OATT) § 30.7.3. Note: A full SRIS is required for large facility projects 80 MW or greater in size. Projects less than 80 MW in size require only a partial SRIS. The requirements for a full versus partial SRIS are the same except that an assessment of the impact of the project on interface transfer limits that is required for a full SRIS, is not required for a partial SRIS. NYISO Transmission Expansion and Interconnection Manual, at § 3.3.3.4. The NYISO Operating Committee must approve each final SRIS. Upon Operating Committee approval of the SRIS, NYISO considers the SRIS for that project complete. NYISO Open Access Transmission Tariff (OATT) § 30.7.4; NYISO Transmission Expansion and Interconnection Manual, at §§ 3.3.3.4-3.3.3.5. 8-NY-g.49 – Does the Facility Meet the Class Year Interconnection Study Eligibility Requirements?